Learn foundational log-cabin quilting techniques start to finish while making a functional potholder! 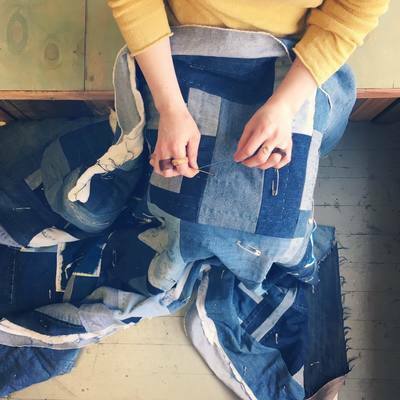 Reuse vintage and reclaimed fabric to construct a unique geometric design. Learn how to plan out your color scheme, cut fabric, and begin sewing your top from the center of your quilt with a straight stitch. We’ll discuss how to choose the correct batting for the inside of the quilt, and you’ll back the quilted piece with a larger piece of fabric. 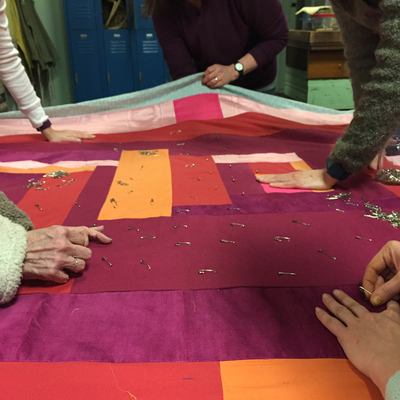 The class will cover three quilting techniques (stitch in the ditch, tying and sashiko), and begin quilting their layers together. Lastly, the class will learn how to finish the edging of the quilted piece to create a finished look. A variety of fabric will be available to you, but feel free to bring in bedsheets, jeans, and other fabrics from home to create your quilt. Participants will leave with a finished potholder, and the knowledge to continue working on larger quilt projects outside of class. Sewing machines, fabric, jeans, bedsheets, thread, etc.